Chanteur Country US né le 25 Janvier 1936 à Cuero (Texas). Il fut disc-jockey sur KULP de El Campo (Texas). 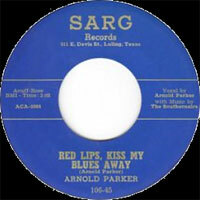 Arnold Parker took 40 years to be discovered by audiences much beyond the orbit of his native Texas and adjoining regions. 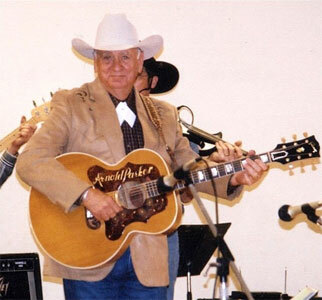 He was a Texas-based country artist who started singing as a boy, at home and later in church in the late '30s. 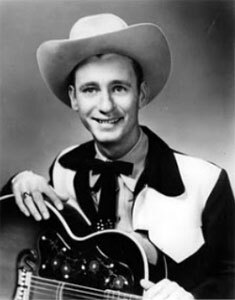 He joined the group the Southernaires as their singer in 1953, at age 17, and initially began recording on Charlie Rich's Sarg Records. 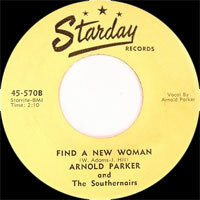 Parker and company jumped to Starday in 1956, where they recorded a rockabilly-style single called "Find a New Woman." He never charted at the time -- though the record, issued on the regional Dixie Records imprint, did surface in 1999 on Ace Records' Starday-Dixie Rockabilly, Vol. 1 -- but the group did make it to the Louisiana Hayride, where they appeared on the same bill with Elvis Presley. 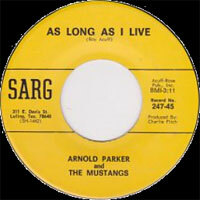 In the early '60s, Parker and lead guitarist/singer Ken Williams put together a band called the Mustangs and enjoyed considerable success as a performing group in Texas and the surrounding states, and recorded for the Sarg label into the early '70s. Parker retired from music in 1973. In the late '90s, to the astonishment and delight of the now 63-year-old Parker, "Find a New Woman" began turning up on some radio station play lists and getting heard in Europe as a result of the Ace Records Starday-Dixie Rockabilly, Vol. 1 CD.